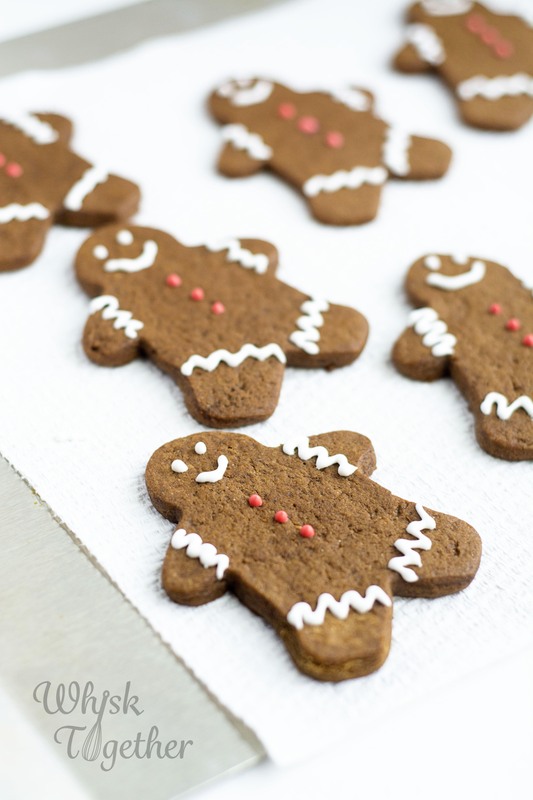 Gingerbread is very soft and can be difficult to work with. 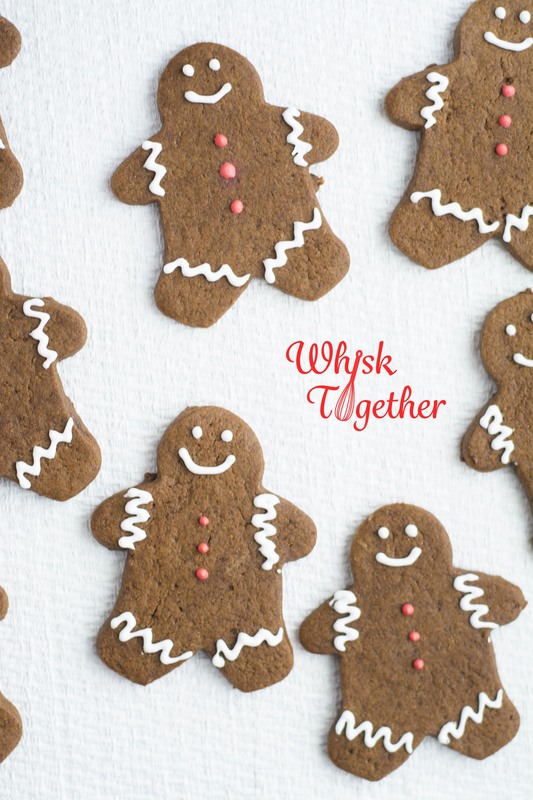 My favorite recipe is America’s Test Kitchen’s Thick and Chewy Gingerbread Cookies. You can make them in the food processor or follow the same directions using a mixer. Gingerbread needs to be kept very cold. Divide the dough into halves. Roll it in between two pieces of parchment. Keep it in the freezer for at least 20 minutes. I like to put mine on a pizza stone because the stone keeps things hot AND cold. The stone keeps the cookie dough colder longer and allows me to make more cookies. Once the dough is too sticky because it has warmed up a bit – start all over. Roll it in parchment again and stick it back in the freezer for 15-20 minutes while you work on the other half of the cookie dough. Keeping it cold is key to less frustrating cookies. 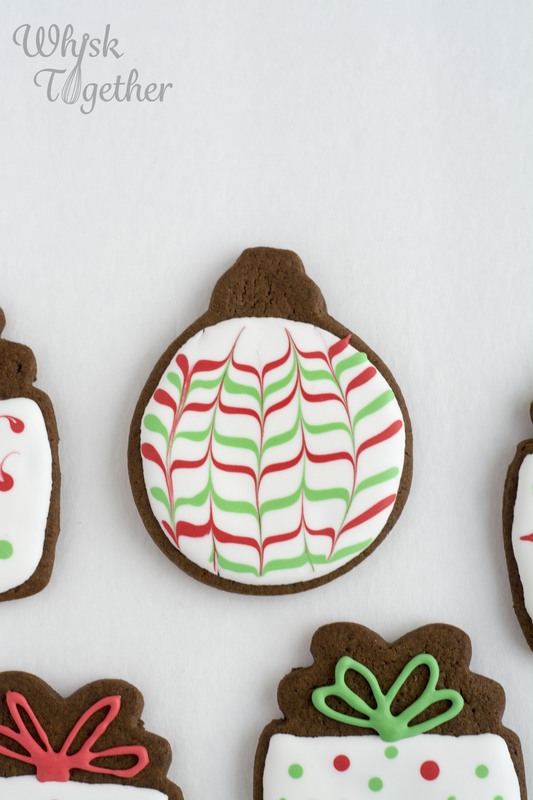 To keep their shape, both gingerbread and sugar cookie cut outs can be put into the freezer for about 15 minutes before popping them into the oven. I use this trick always on sugar cookies. I don’t find it as necessary with gingerbread because they will puff up a bit anyway. 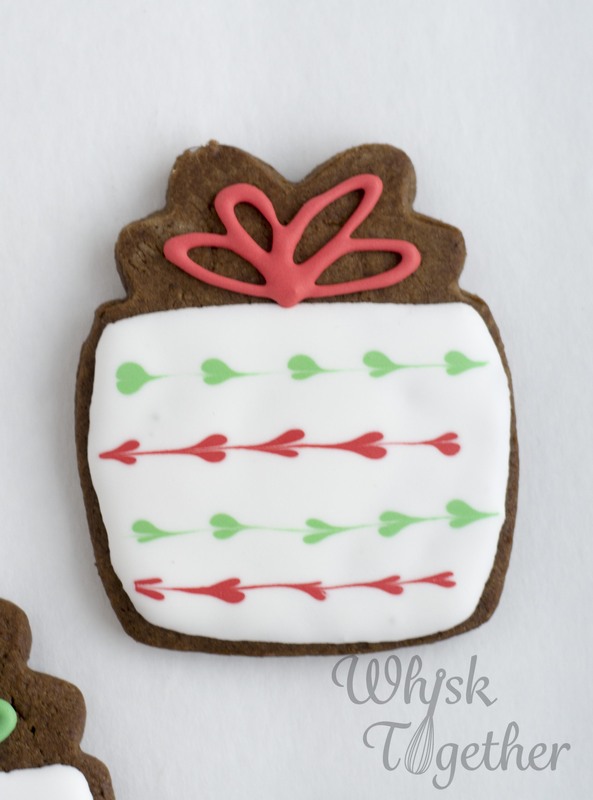 A simple white royal icing such as the one used above and on the gingerbread men is all that is needed for beautiful cookies. 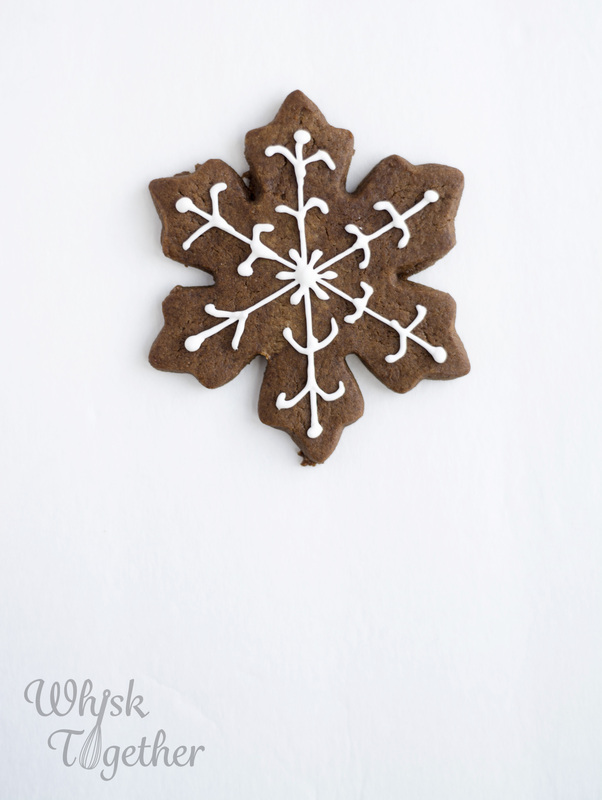 I use a small batch for the snowflake and gingerbread men because they are not flooded with icing. 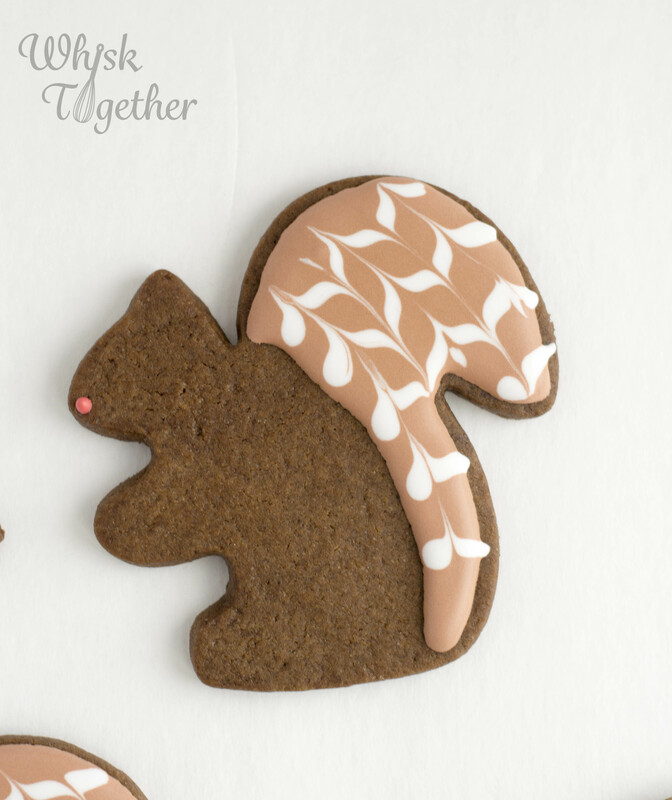 For more detail, sprinkle some sparkling sugar and sanding sugar onto the icing while wet. 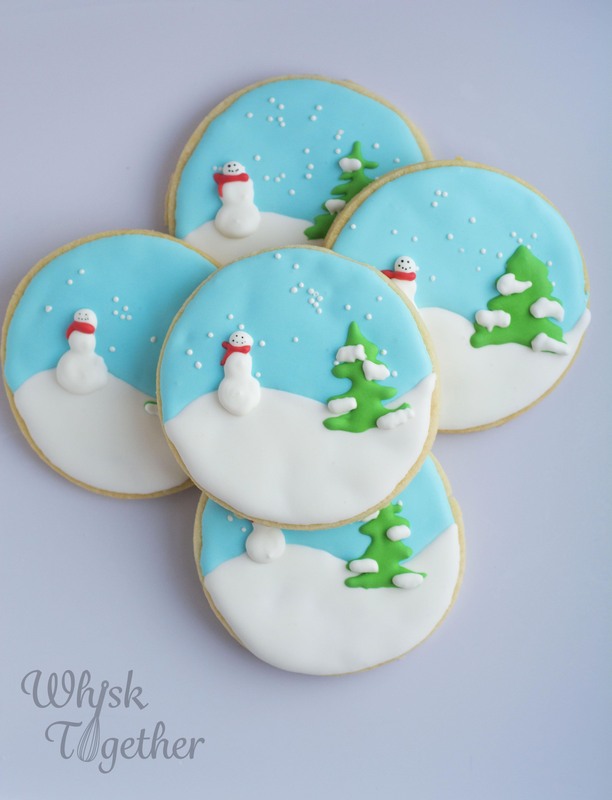 Let dry 4-5 hours for outlining and overnight for a fully iced cookie. Instead of piping a separate second layer, I like to use the wet on wet technique. Here, the trees were flooded with royal icing. Next, red lines were piped on top with a #2 tip. Finally, I dragged a toothpick from the top to the bottom. I like using gingerbread on trees since the trunk is already brown! Here is a close-up of the Christmas tree. The icing was 15 second royal icing. 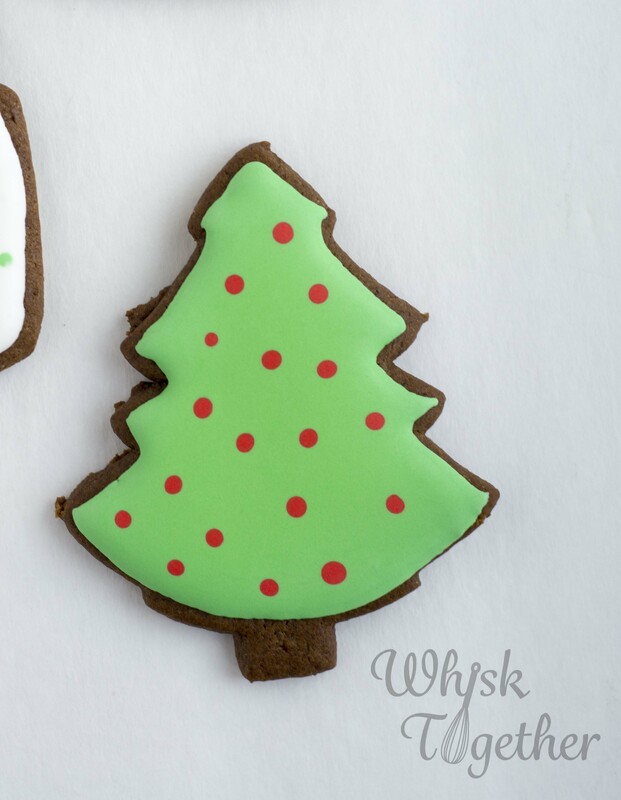 For a different look, use the same red icing to pipe red dots on the wet green icing. 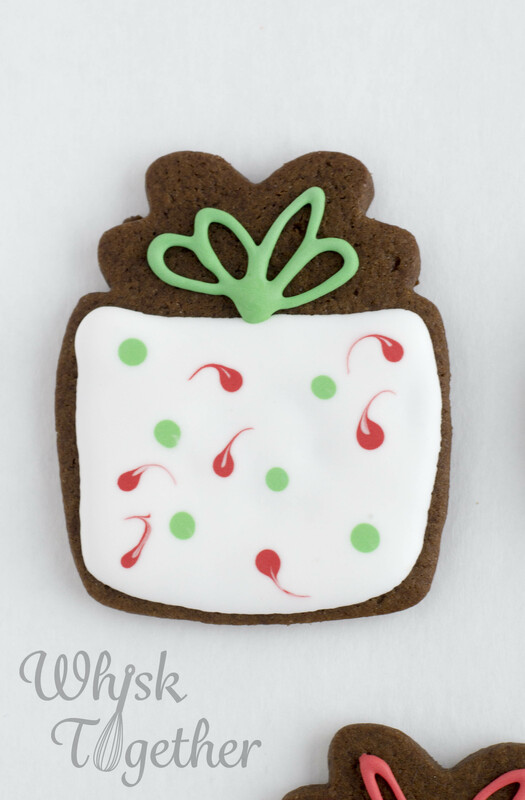 Here, dots of red and green royal icing were dabbed onto the wet white icing. Then, I dragged the toothpick through the line of dots. One way (towards the right) for the green and the opposite way for the red. Same 15 second flood icing. A stiffer red icing was used for the bow. I messed up one of the red dots on this cookie. So, I took my toothpick and intentionally messed up all of the red dots. I put the toothpick into the center of the red dot and dragged it through the white icing. A flood royal icing again was used. 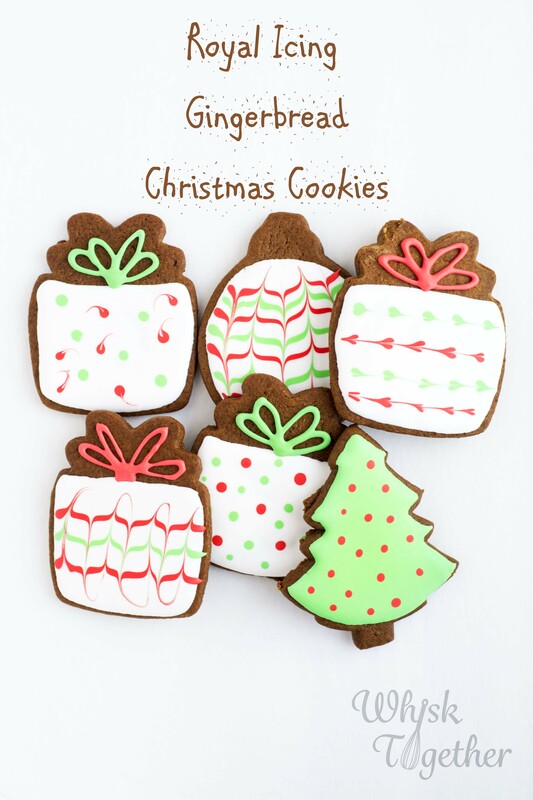 Instead of dots, lines of red and green icing were piped onto the white icing. I dragged a toothpick up and down through the lines to create the marble effect. I think the marble effect looks awesome on ornaments. 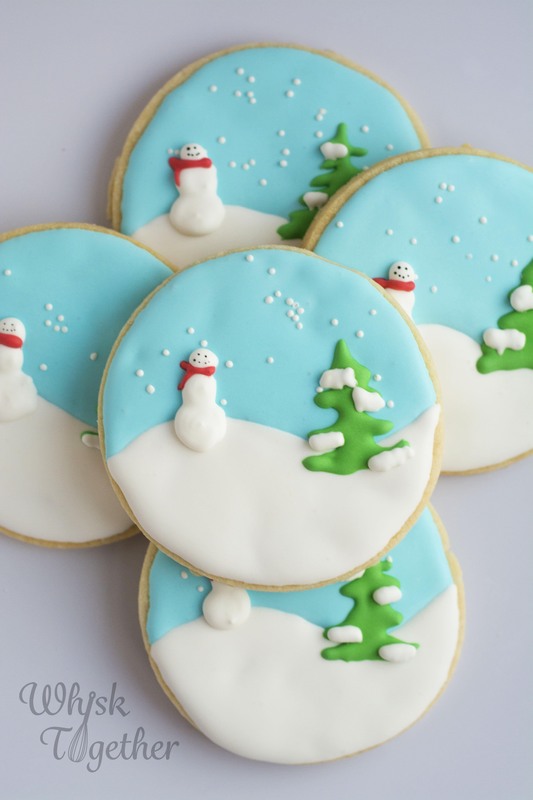 These snowglobe cookies were created on sugar cookie dough. 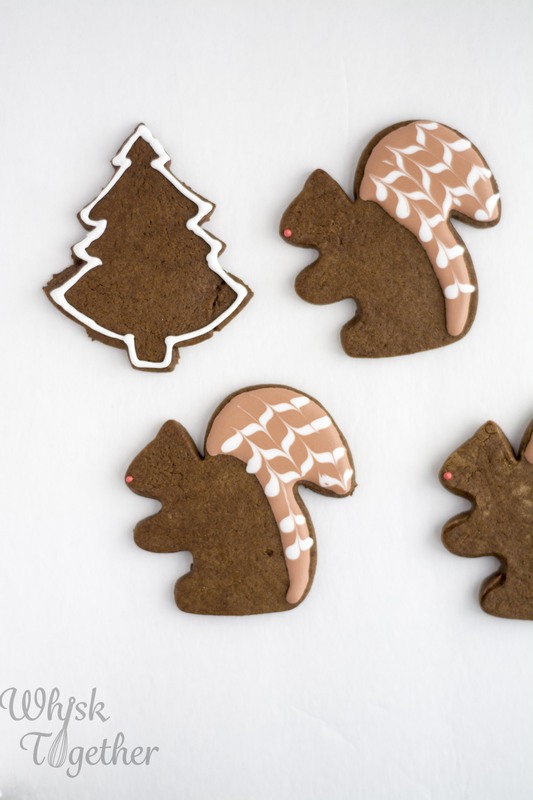 But, they would also work on gingerbread. The dough recipe is from a pretty famous cookie baker and food writer… but it contains no salt. This troubles me and I will have to play with the recipe some more. As is, the recipe is still very good. When I say put under the fan, I use a desktop fan from my working days that kept me cool at the office. It is not necessary, but I find it cuts down on drying time. 1. Flood the top part with sky blue royal icing. Sprinkle some white non-pareils. 2. Put the cookie under a fan. While you finish the rest of the cookies, the fan will have dried the first cookie for 15 minutes. You want to wait 15 minutes for the royal icing to crust over a bit. 3. Flood the bottom part with white royal icing. 4. Let the cookies dry under the fan for about 30-50 minutes. Whatever time amount you are comfortable with. 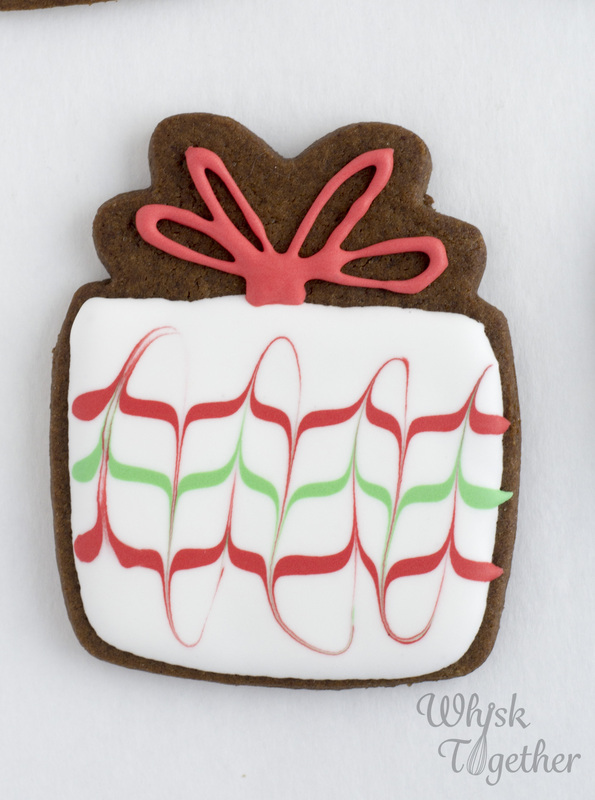 Most professional cookie decorators Let the cookies sit out for 24 hours or overnight before applying the second coat. I don’t like my cookies to sit out that long, so I put them under a fan for about 30 minutes. Proceed with caution or wait the full 12-24 hours to apply the second coat. 5. 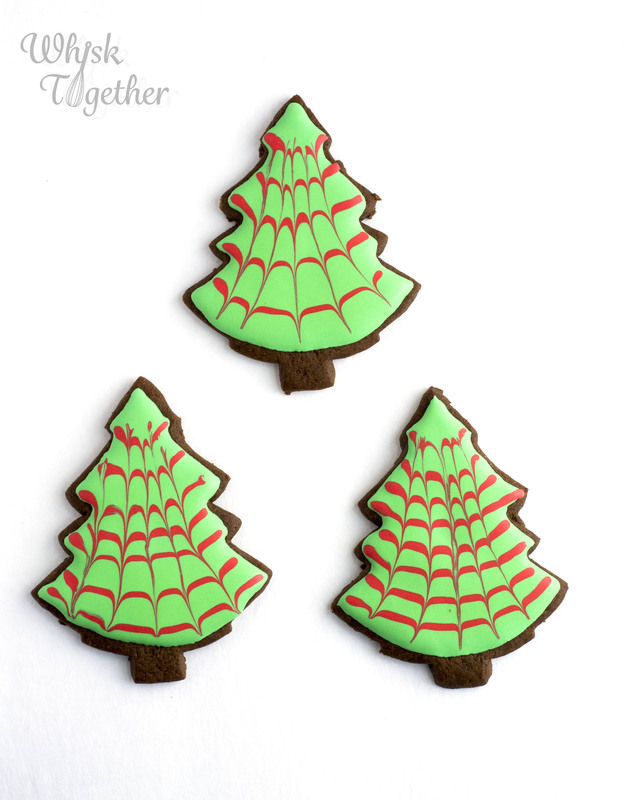 Pipe a Christmas tree on each cookie using thick royal icing. #2 tip. Put under the fan to dry. 6. Pipe a snowman in white. If the trees are dry enough, pipe the snow on the trees. #2 tip. 7. Pipe the snowman’s scarf in red with a #1 tip. 8. To add the face, I used a toothpick and black food coloring paste. I drew the face on freehand. This may not be the best way… because the next morning the black was still wet. A food coloring pen (fine tip) would be better I think. 9. Dry overnight. Carefully package in an airtight container or bag. Need a theme? 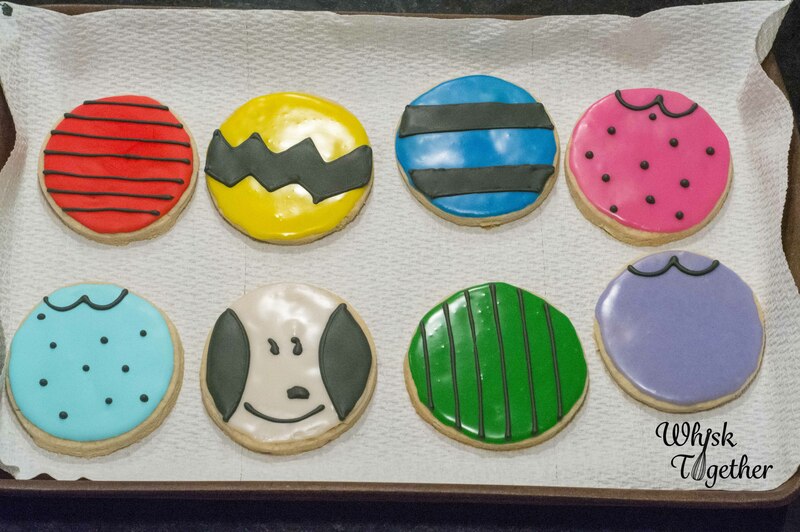 These Charlie Brown Christmas Cookies were made for a Christmas dinner tonight. Each person at the table got a different character cookie. All were made with flood icing. The shiny ones were made with Cookie Glaze. The matte ones were made with royal icing. Why change the icing? Because I ran out of royal icing! Cookie Glaze is easy and forgiving. It was piped on with a simple ziplock bag because I had so many colors to deal with and the piping did great with just a bag. Though poor Snoopy looks like he oozed a bit. Now the black highlights were done in thick royal icing so that the black would maintain its shape. 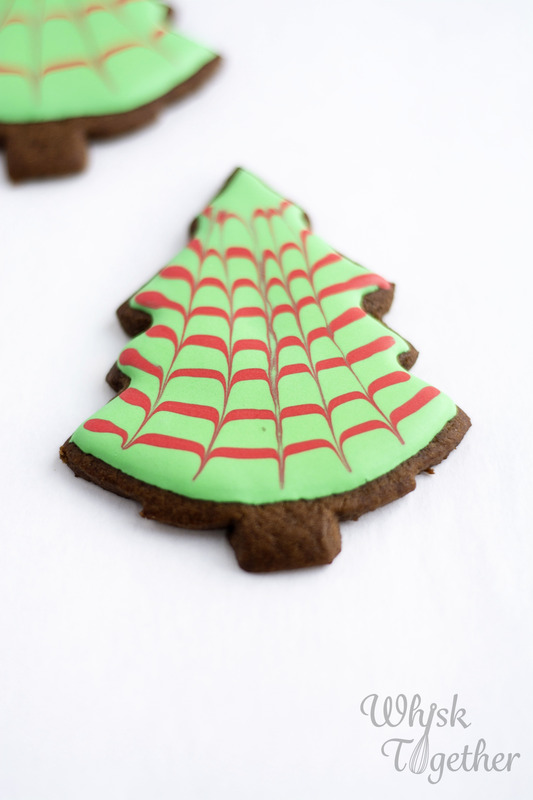 I am doing very little Christmas baking this year, but your chewy gingerbread cookies are on my list! I’m think using my Star Wars cookie cutters for some would be appropriate this year, in addition to some traditional gingerbread men. I am cutting down as well. I used to do 6-8 items. But with Hershey changing their bags and ingredients, the cookies don’t turn out as well as they used to or yield the same amount.